As a family favourite, the call from Crich Tramway Museum was very welcome and exciting! They were looking for work on a new guidebook to sell to their visitors, packed with information not available anywhere else in the Museum as well as providing a route to explore the site. Since 1959, the Crich Tramway Village and National Tramway Museum have created a unique visitor attraction out of the spoil of a disused Derbyshire quarry. Initially intended as a space to preserve and repair retired tramway cars, it has since developed into a fully fledged attraction with working tram routes, indoor exhibition spaces, nature walks and more, as well as facilities for visitors to eat, drink and explore the site. Their existing Guidebook had served them well for 5 years, but sales were declining and the content was getting dated especially as the recent years had brought a number of rapid changes and improvements. The refreshed Guidebook was to be packed with new content, images and information. I worked alongside the team at Crich to design the Guidebook alongside their brand guidelines. The Crich team were keen to provide a clean, clear look to the Guidebook, this involved stripping back some of the more over-decorative elements of the brand and streamline fonts and photography frames, some of which had given other marketing materials a “seaside tram” feel, but didn’t encompass the wider tram history the museum explored. The book is compact, easy to handle whilst visiting, and utilises well-sized text, carefully set with a selection of great images of the Tramway Village in action as well as historical images of the site as it developed. An especially interesting spread includes a timeline of the sites history, the arrivals of each tramcar and the progress of the site from hobby enthusiasts storage to a popular local day out. The final printed piece, a 52-page perfect bound book, feels excellent to hold, the print provided made a great job of the production. 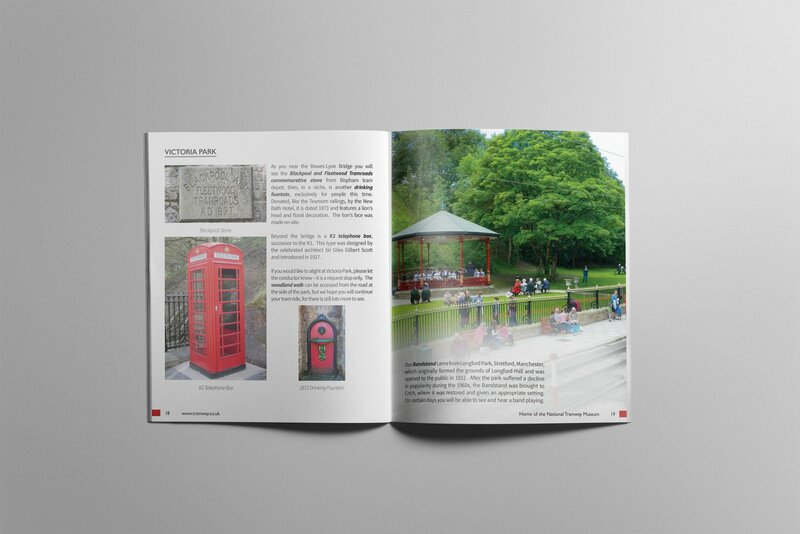 You can buy the Guidebook from the Tramway Village when you visit, or if it’s perhaps a little too far, purchase it online from the Crich Tramway website. The project was great to work on, the folks at the Tramway Village a pleasure to collaborate with and I’m delighted with the result of the hard work of everyone involved.